Are you embarrassed and troubled by your reactive dog’s behavior? Reactive dogs are often dealing with anxiety and fear. Rather than retreating or backing away from what they perceive as danger, however, they tend to lash out. 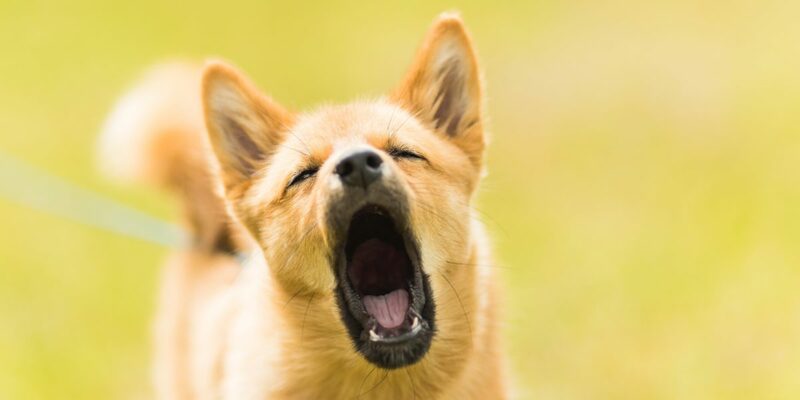 Your dog might bark, growl, lunge, put up his hackles, and otherwise make a big show of aggression. The object of his fear might be anything from another dog or an unknown human to a person on a bicycle, a car, or a motorcycle. The keys to managing a reactive dog include training, avoiding triggers, and, in severe cases, medication. To train your reactive dog, you need to understand something about dog psychology. Dogs are pack animals, and each pack has a leader. Your dog’s pack is your family. If you live alone with your dog, then you are your dog’s pack. Someone has to be the leader; if nobody steps up, then this upsets your dog, because the dog assumes it must be the leader. Your dog will react strongly whenever it senses that the rest of the pack is unsafe, and if the dog’s anxious, it might think that a wild rabbit in the backyard, a small child, or a thunderstorm are serious threats. Starting with general obedience will allow you to work up to a consistent “stay” command, which can ward off some of the reactivity. From there, you’ll need to work on building up the dog’s tolerance level to whatever your dog’s reacting toward through desensitization. In a perfect world, these methods would work, but there is going to be time during training and, for some dogs, despite training when they don’t work. If you’re still having trouble getting your dog to listen, using a training collarcould help with the training process. While you are training your dog, it’s important to keep him calm. Avoid the things that you know trigger your dog’s reactive behavior. If cars are a trigger, take him for walks only in quiet neighborhoods or in the woods where he would not be likely to see a car. If other dogs are a trigger, don’t be afraid to verbally warn owners of dogs who are outside when you are. For some dogs, these suggested measures will not be enough. In that case, your veterinarian might recommend anti-anxiety medications to help your dog relax. There are side effects to these medications, so it’s best not to depend on them as the first line of defense against reactive behavior. If training and minimizing triggers isn’t enough to keep your dog under control, short-term or long-term medications can allow you to enjoy your dog and keep the dog safe in any situation by reducing your canine’s reactivity. Reactivity is hard for your dog to live with; it’s also hard for you, as the dog’s owner, to understand and accept. Once you find a solution that works for your dog, you might find that your dog gets less reactive over time as the dog builds up trust in you. Keep looking for a solution with the help of your veterinarian and a trusted trainer.